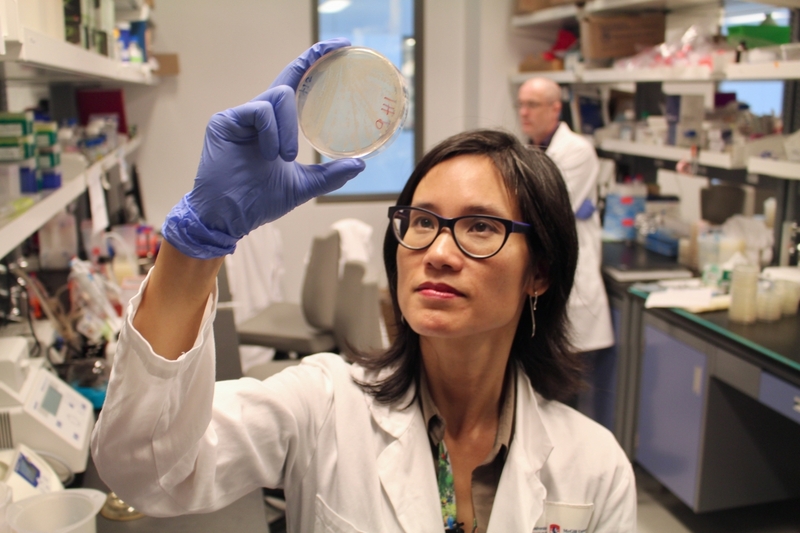 The RI-MUHC’s research team discovered a new cellular target that can weaken the bacterium Pseudomonas aeruginosa, a daunting microbe which can become highly tolerant to many antibiotics, and thus refractory to antibiotic therapy. The team’s findings are published this week in Proceedings of the National Academy of Sciences (PNAS). P. aeruginosa lung infection is the leading cause of death for thousands of people living with cystic fibrosis. This bacterium also causes many other serious infections in people with weakened defenses and immune systems. “P. aeruginosa causes lifelong lung infections in individuals with cystic fibrosis, and these infections cannot be cleared, even by cocktails of the most potent antibiotics available,” says Dr. Nguyen, who is also a respirologist at the MUHC. P. aeruginosa has been listed among the "nightmare bacteria" by the Centers for Disease Control and Prevention (CDC) in the United States, with an estimated 51,000 healthcare-associated infections each year resulting in around 400 deaths. It is a common cause of healthcare-associated infections such as pneumonia, bloodstream or urinary tract infections, and surgical site infections. The study Superoxide dismutase activity confers (p)ppGpp mediated antibiotic tolerance to stationary-phase Pseudomonas aeruginosa was co-authored by Dorival Martins (First author), Geoffrey McKay, Gowthami Sampathkumara, Malika Khakimov, Ann English, and Dao Nguyen (Lead author). This study was made possible by the financial support of Burroughs Wellcome Fund, the Canadian Institutes of Health Research (CIHR) and Cystic Fibrosis Canada. The Research Institute of the McGill University Health Centre (RI-MUHC) is a world-renowned biomedical and healthcare research centre. The Institute, which is affiliated with the Faculty of Medicine of McGill University, is the research arm of the McGill University Health Centre (MUHC) – an academic health centre located in Montreal, Canada, that has a mandate to focus on complex care within its community. The RI-MUHC supports over 420 researchers and close to 1,200 research trainees devoted to a broad spectrum of fundamental, clinical and health outcomes research at the Glen and the Montreal General Hospital sites of the MUHC. Its research facilities offer a dynamic multidisciplinary environment that fosters collaboration and leverages discovery aimed at improving the health of individual patients across their lifespan. The RI-MUHC is supported in part by the Fonds de recherche du Québec – Santé (FRQS).